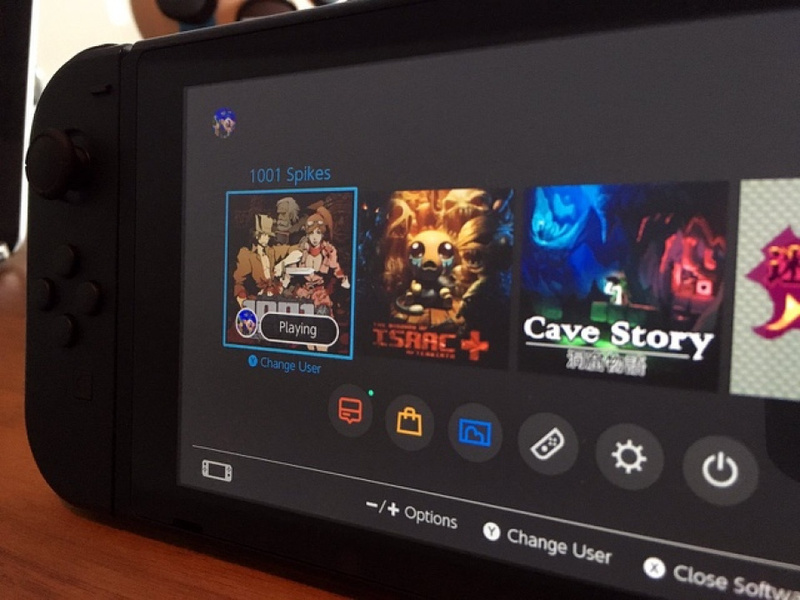 "Isaac was lonely so we brought a few friends to keep him company"
Earlier today, Nicalis - which is already bringing The Binding of Isaac: Afterbirth+ and Redout to Switch - tweeted a photo which showed one of Nintendo's new consoles proudly displaying icons for 1001 Spikes and Cave Story, two titles previously published by Nicalis on other formats. Isaac was lonely so we brought a few friends to keep him company. The tweet has since been deleted, which suggests that Nicalis was perhaps getting ahead of itself here. However, it might not be to do with announcing games early but the fact that the photo clearly shows elements of the Switch UI which have thus far been hidden from view. For starters, there's a dark home screen theme (previously we've only seen white) and there's also a "Change user" shortcut. Why do you think the image was deleted, and are you pleased to see more games coming to the Switch? Let us know with a comment. What about VVVVVVV? That was a quality game by those guys. Awesome, getting Isaac day one, the others as soon as they are up. Also, nice! Backgrounds! Hope they're not in any kind of trouble for that. Whats more interesting is the UI in the picture. Will we be able to change the color? What about background themes? I myself don't really care but I'm stoked we will have the option to personalise our console. Not too long now and you will be mine, oh yes, you will be mine! I don't care that much about The Binding of Isaac, but i wouldn't mind giving Cave Story another go. On the topic of guesses, any ideas on the fourth game in the row? The picture mostly obscured? I wonder if this means I'll have to buy it again for Switch or if my WiiU purchase carries over. Should note that the game icon that's cut off on the right is a logo from Hydra Castle Labyrinth, a freeware PC game. sort of looks like they might publish it on the Switch. I really love the UI, it takes the best features from my 3DS, Wii U, and PS4 UIs. 1001 Spikes is dope!!! Hopefully, I don't have to pay for it again though...you have seen what MSFT has done with 360 games on the Xbone, have you not?! Themes would be great! You want more of my money, Nintendo, get those themes going! I liked Cave Story so much, it has become the epitome of Indie games for me. Only thing is..... time to move on from it, or make a new installment, yeah? Yeah I'll buy Cave Story again. Who wouldn't? That and VVVVVV are two of the finest indie platformery I've played. They probably won't bother with this but, I want them to have the option to play Cave Story at the original 50fps. Well, they must have gotten a call from Nintendo or their own executive in charge of the project to remove the twit so quickly. Maybe when a few more games get announced, the Negative Nancy's will realize that what has been announced for launch and the first year isn't everything we'll be getting, and will stop whining. 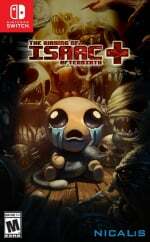 what happened to the Cave Story remaking? I think they probably had to delete due to showing off too much of the UI, or rather, they're probably showing off the UI on a debug kit, which might be slightly different and misleading to consumers. I think that "Y Change User" has been the highlight of my day so far. For those excited to see Wii U go away and Switch come in, the playable Wii U kiosk in my Target has been replaced w/ a big Switch wall sign. @Captain_Gonru You told me about this once, didn't you? Maybe it was TRU? @Captain_Gonru Since you are still doing the rounds, have you seen any of those hand written - "Due to low stock NES Mini is in short supply" signs? I didn't see any sign or a place for them in store, I'm wondering if Target gave up. No Wii U, two 2DS w/ MK7 bundled. That was it for Nintendo hardware. BTW, I am happy to see the big Switch sign, Nintnedo getting out in front of things this time around, I was just annoyed it was covering up where the Wii U used to be. I played it soon as it came to the 3DS eshop and fell in love with it immediately. We really need more deep platformers like this and I hope being on the Switch will deliver the same kind of experience. 1001 Spikes and Cave Story are both awesome games. Here's hoping they make it over! Not sure if someone else said this, but that other game on the list to the right that you can't quite see is confirmed to be Hydra Castle Labyrinth. @SLIGEACH_EIRE You're not even trying. Even Ron Paul deserves more effort than that. What is the game in the far right? Played Cave Story on the Wii, loved that game. Not sure if I'll double dip for it though. Heck, I'll buy Cave Story a third time. I adore that game. Me likes the dark interface. Oh sweet jeans! It would be awesome if Cave Story got a physical release too! Hopefully it's the CS+ version on Steam. Twitter deletion, totally not suspicious at all. Cave story!!! Keep the announcements coming!! Nintendo already has software gaps to plug in 2017! Eh, they were both enjoyable games but maybe bring something new out now? One of my favorite indies and I'm glad it's still expanding it's grasp... but when's that sequel Pixel said was 'very likely'? I hope CaveStory gets the superior version that is on Steam, plus more. Also Kero Blaster needs more nintenlove Pixel! I have 0 interet in Issac. Tried on PS+ and found little fun or enjoyment in it. The more, the merrier, though, I wouldn't mind their releases being more apart from one another to keep the steady flow of Switch releases intact. I think the black ui looks better than the white. Easier on the eyes to. Especially at night. Not saying I'm gonna stay up all night to play Zelda in my bed but I probably will. @rjejr IGN/Vooks have now confirmed that the Switch can have up to 8 different user accounts from any region on one Switch - but Nintendo have recommended to buy only from your region for full support. So the Switch should be fully region free outside he annoyance of switching to another account. I really like the look of the UI. I think it was deleted since this likely is a development kit. One day people will catch-up with the fact that once something is put on the internet it is there forever, there is no deleting. Awesome! I was gonna buy Cave Story on Steam, but I'll get it on the Switch instead because of the portability! @Captain_Gonru I'm taking my kid to TRU this afternoon so he can spend some of his birthday money on toys-to-life B1G1 stuff. I'll let ya know why I see, or don't see. Whatever I find there should be a nice change from watching Inauguration stuff all day. I can't help myself. @OzHuski "Switch can have up to 8 different user accounts"
Thank you very much for that, good to know. I was worried about there being only 1 account like on 3DS. We just got a PS4 for Christmas and I transferred over all of our family accounts from our PS3. Then I hooked up my PSTV on another TV to stream gameplay, but even though PS4 remote play is a big selling feature of PSTV - the only thing I'll probably ever use it for - I can only stream my account from the PS4, nobody elses, which means I'm the only one who can remote play our save points, not my wife or kids. So again, Sony let me down w/ the 1 thing PSTV is supposed to be able to do well. Good to see Nintnedo got this right, been a rough week for them. @Captain_Gonru "They aren't taking preorders"
Well that will be less "Sorry we didn't get enough stock and had to cancel your pre-order" emails that they'll have to send out. I wonder if retailers are getting wise to Nintendo and all the pre-orders have small print that says - "This is a pre-order for a console when we get stock in, not for getting a console on the launch date." Guess we'll see, though I'm still most curious abut the going price on eBay at launch. $400? $500? Too bad it launches on a Friday and not a Saturday or I'd go to the store to watch. Guess I could do midnight Thursday but I'd rather sleep. @KirbyTheVampire big thanks! Went to Youtube to check it out, pretty cool but it looks hard. I will try it if it really comes out for Switch. @Captain_Gonru "So, logic WOULD dictate that they wouldn't take more orders than they knew they could fill. But, we'll see." Let's just say I don't trust Nintneod's logistics. They said 2 million at launch. That's 2 million spread out over the US, EU and Japan. And probably a few other countries not worth mentioning. Well maybe worth mentioning all combined. So Nintnedo needs to make the 2 million and ship them all exactly to the right places to fulfill all those carefully pre-detemrined pre-order numbers. I just don't see that happening. Did you know it takes about 6 weeks to ship stuff from China to the US? Switch launches 6 weeks from today. So anything that isn't already on a it's way to a boat isn't going to be there on launch day. I'll be shocked, really very shocked, if we don't hear stories about pre-orders not being fulfilled. 1001 Spikes is sadly underappreciated. I consider it one of the best platformers ever made. It's one of my most played Wii U games. To me this is only good news. The more good games that find their way to Switch, the better. @Captain_Gonru So, back from TRU, and their video game section is now smaller than Targets shrinking section. The back glass enclosed wall was filled with videogames, but that was about it. The toys to life, which used to spread out all over the store, is now an aisle over. No Wii U or PS4 kiosk. The 3DS kiosk had a playable system, but the enclosure was empty. No sign anywhere of Switch. The entire area felt like a store in going-out-of-business mode. I didn't see any PS4 in stock or sign of PSVR. They did have a few $79 PSTV, which is just funny b/c it's $10 less than the Switch dock. So yeah, STEM and robots and a row of tablets and those retro consoles, but I didn't see an empty spot for NES Mini, so they must have given up too. It was all quite depressing. Just dawned on me, no 3D printers, I thought those would be in there by now, maybe somewhere else. So anyway, if Nintendo is planning to sell a lot of Switch, Switches?, they better not count on TRU to do it for them. @Captain_Gonru I always appreciate the info but don't go out of your way to get it, whenever it comes it comes. But toys to life is dead and video games are dieing. The mark-up on those $199 Cozmo robots has to be higher than videogames, same for the $299 3D printers. And as my wife said, TRU and Target don't want to compete w/ Amazon and Gamestop for low margin merchandise. Can't really blame them with digital getting so popular. Bad time to launch a Switch though. Of course March was always a bad time to launch, I mean besides that. Our shows are back this week, happy distractions. @Captain_Gonru Had the pre-order discussion again this morning w/ my wife. She's blaming it all on the retailers like Gamestop and Best Buy, saying they get a large number like 100,000 from Nintendo then divide that up between all their stores, then ship the wrong amounts to the stores. So basically every pre-order launch is a logistical nightmare. Chinese New Year starts soons, nothing gets done for a whole week, no manufacturing, no shipping, so there will be a big lull in Switch to shops after launch. Nothing Nintendo or anyone else can do about that. Fortuantely they'll have that game gap between Zelda and MK8D and Arms to replenish. @Captain_Gonru I mean the stores in the rich white neighborhoods get more Switch when Nintendo doesn't send them enough /c those people are likely to spend more on games and accessories. Sorry, been a rough few days on Twitter. And my football game distraction isn't very distracting, or much of a football game. @Captain_Gonru Thanks for the update. When I was there Playmation was already a very teeny tiny small spot in the last aisle, opposite the wall w/ the weird microphone junk. DI figures was half a wall next to the Lego D figures, across from Skylanders. The rather large amiibo collection was on the back wall next to the videogames. But it was odd to the see figures more in the section I associate w/ the sports and musical instruments than videogames. Switch will need a lot of space though for the Joycon, dock, Pro, cases. It's a platform built around a device. I'm keeping it generic. Need a laugh? This 1993 episode of Dinosaurs, titled "Green Card", is both painfully prophetic and the wittiest thing I've ever seen. And I've watched it pretty much every year since it aired nearly 25 years ago. At least watch 6:00-7:30 and 15:50 on.